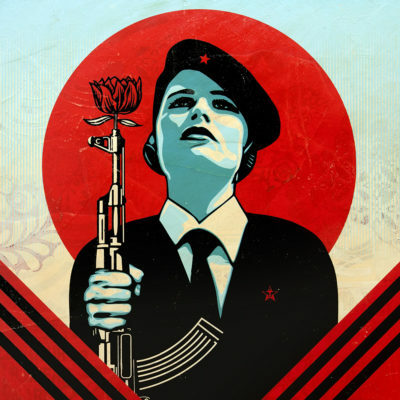 “Printed Matters” is a continuous series of exhibitions which focus on the importance of printed material in Shepard Fairey’s art. Each exhibition highlights this significance by incorporating a variety of the artist’s printed material—including screen prints on paper, editions on wood, editions on metal, and fine art collage—with new works added for each venue, making each “Printed Matters” exhibition a unique experience. Beginning in 2010, the “Printed Matters” platform was first presented in Los Angeles and for its next installment will exhibit in Lisbon at Underdogs Gallery and will be on view from 21 to 29 of July, and 1 to 23 of September. The gallery will be closed during August. “I’m a product of the era of mass production and the mass culture it has created. I can’t imagine my art practice without the influence of, and the use of, printing. Some of my biggest art influences were not paintings, but printed things like album covers, skateboard graphics, punk flyers, and T-shirt designs. When I discovered stencil making and screen printing in high school, I used them to make t-shirts and stickers, but by college I began to use screen printing to make art. I enjoyed illustration, photography, collage, and graphic design separately, but with screen printing I could synthesize those techniques into an integrated final product. Screen printing also provided latitude for experimentation and the ability to make multiples, and my style began to evolve as I explored the graphic nature of the medium. I tried to make images that would translate well to screen print production. A harmony of beauty, power, and utility was my goal.